Milk chocolate ball with a hole for fillings. If out of stock, may need to be Special Ordered. 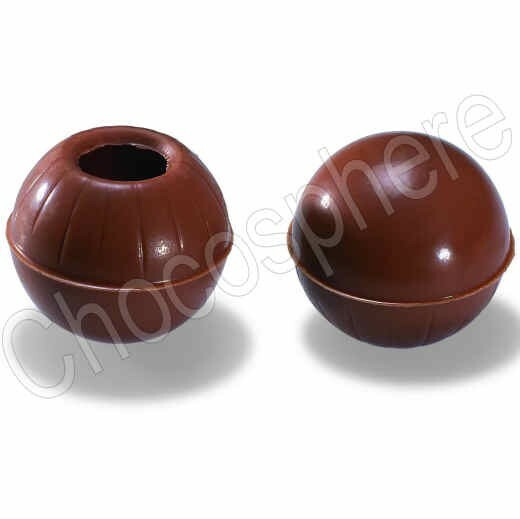 Callebaut Milk Chocolate Truffle Shells are hollow chocolate balls that you can fill with your delicious ganache or other creations. They save time when making filled chocolate truffles while bringing forth the finest with Callebaut's milk chocolate. Made with Dark 35.6% cacao chocolate. These truffle shells are 2.6g per form, 26mm in diameter with a 10mm diameter hole. Total net weight 1.36 Kg / 2.99 lbs.